If Charles Dickens were trying to write A Tale of Two Cities about the Microsoft Partner Program in 2007, he wouldn't be able to get past his first sentence. Dickens famously starts his master work with, "It was the best of times, it was the worst of times," but RCP's 2007 reader survey reveals no such dichotomy in the Microsoft channel. For you, the Microsoft partner, it's the best of times -- for the most part. You like working with Microsoft-even if you say it's not always easy. You think Microsoft treats you fairly, and you're mostly happy with how the company structures the partner program and its various certifications. You see a bright future in being a Microsoft partner. You're not even all that interested in working with Microsoft's biggest competitors, such as open source and Google Inc. Microsoft is a major driver of your business, even if it's sometimes a challenge to adapt your business model to Microsoft's pricing strategies. Still, you have some familiar reasons to complain. Microsoft remains a mystery to many of you -- a massive entity that overloads you with information but doesn't always provide easy-to-reach contacts when you need to talk to somebody at Fort Redmond. Licensing is still kind of a mess, and your customers continue to find Microsoft products expensive. That old problem you've always had-negative perceptions of Microsoft security -- is still hanging around, too. Not one of those complaints is new, but all are still prevalent. Nevertheless, the numbers tell the story: It's a great time to be in the Microsoft partner community. More than 80 percent of you report being happy as a Microsoft partner-and 30 percent of you go as far as to say that you're "extremely happy." You seem content with the way Microsoft has set up its partner program, too. About 60 percent of respondents said that the program should not have more than its current three levels: Registered Member, Certified Partner and Gold Certified Partner. Two-thirds of you shook your head "no" when asked if it was too easy to reach Gold Certified Partner status, and almost 60 percent of you said that it's not too easy to become a Registered Member, either. So, despite the partner program having as many as 400,000 members by Microsoft's own count, you don't feel as though Microsoft is giving away membership or certifications too easily. Even Gold Certified Partners, which represented almost 28 percent of the respondents in our survey (compared to 18 percent Certified Partners and 50 percent Registered Members-the rest are Microsoft partners, but not official program members), rejected the notion that it's too easy to reach their lofty status. More than 50 percent of Gold Certified Partners did not believe that it's too easy to reach Gold Certified Partner status, and more than half of you at the highest level also said "no" when asked whether the partner program should have more levels. You were, however, a little less sure about the ease of becoming a Registered Member than the sample as a whole-39 percent of Gold Certified Partners said that it's too easy to become a Registered Member, while 38 percent answered that it isn't. More than 60 percent of you felt that Microsoft listens to its partners, and 75 percent of you said that Microsoft is a fair company with which to work. More than 80 percent of you felt as though Microsoft's competency programs were important in helping partners differentiate their expertise, and, while 28 percent of you said that there are too many competency programs, 40 percent-a strong plurality-said that the number seems just right. You're not even all that interested in working with Microsoft's competitors, despite the fact that they seem more numerous and threatening all the time. While 48 percent of you said you would drop Microsoft as a partner and switch to another vendor's program only for a "quantifiably better market opportunity," a solid 35 percent of respondents said that nothing could convince them to dump their Microsoft partnerships. While 27 percent of you actively support some sort of Linux-based or open source applications, 58 percent of you do not. And 43 percent of you said that you wouldn't want to support Linux even if you didn't have to worry about your Linux support damaging your relationship with Microsoft, while only 34 percent said that you would give Linux a look if Microsoft wouldn't mind. RCP ran its reader survey from July 11, 2007, through Aug. 13, 2007, prompting readers to respond to the survey via a link in the Redmond Channel Partner Update newsletter, as well as via targeted e-mail blasts. 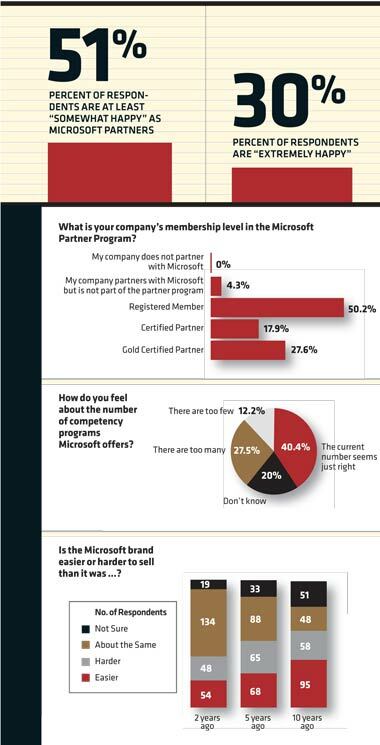 The survey had 268 respondents, all of whom worked for companies that were Registered Members, Certified Partners or Gold Certified Partners in the Microsoft Partner Program, or whose companies partnered with Microsoft but were not formally part of the partner program. Percentages in charts might not add up to 100 due to rounding and availability of multiple answers to some questions. --L.P.
Google, intriguingly, scored a little better on the competitive front. While 41 percent of you said that you're not currently interested in working with Google-and 30 percent of you weren't sure-a robust 33 percent of you said that you'd consider working with Google if you didn't think it would hurt your relationships with Microsoft. By comparison, 37 percent of you showed no interest in working with Google even if Microsoft would look the other way. Although 47 percent of you identified negative perceptions of Microsoft as one of your biggest competitive issues (with the same number citing competition from within the channel as a major issue), a plurality of you agreed that Microsoft products are easier to sell now than they were 10 years ago and not any more difficult to sell now than they were two or five years ago. So, even on the perception front, Microsoft seems to be making gains. But even partners with so much to be happy about can find room for improvement. While the partner program itself elicits few complaints, you're much less happy with Microsoft's licensing policies. Almost 62 percent of you say that Redmond's licensing schemes make it hard to sell Microsoft products. Ken Shafer, owner and currently sole employee of Agape Computing, a Registered Member and Small Business Specialist based in Salem, Ore., says that Microsoft licensing can baffle his customers, who want to spend as little money as possible up front. The notion of a software license being tied to hardware, for instance, is often a stumbling block. "If my computer dies, I have to buy the software again," Shafer says. "[Small business owners] just don't get it. You start talking about all those [licensing agreements], and they start to go blank. It's easy to lose them. You can't get an upgrade through licensing-the only way you can get an upgrade is through a retail box. Their mindset is the least dollar output right now. They'll go for an upgrade but don't understand an OEM license. I understand how the system works, but getting the small business owner to understand it [is difficult]." Ric Ravier, IS manager at Satori Group Inc., a Gold Certified Partner based in Conshohocken, Pa., voices similar concerns. "I can't even figure [licensing] out for ourselves," Ravier says. "We deal with law firms you would think would know what they're doing, and even then they're quite confused." While 46 percent of you say that Microsoft's licensing policies are fair, 30 percent of you say that they're not. But problems with reaching customers don't end with licensing hassles. 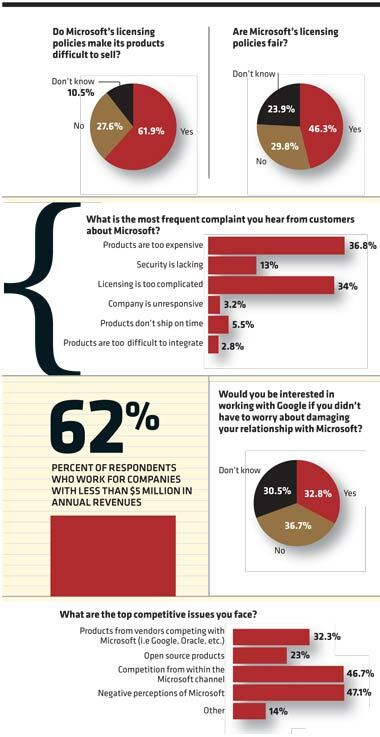 While 34 percent of you told us that the main complaint you get from customers has to do with licensing, 37 percent said that your main customer complaint is that Microsoft products are too expensive. Shafer says that customers often can't believe how much a ubiquitous product such as Microsoft Office costs, and even programs like Microsoft Financing aimed at helping customers afford investments only go so far in helping partners make sales. "They see value and then you present them what it's going to cost them to implement that and you just watch the blood drain out of their face. That small business owner still can't grasp how soon they're going to get a return and how much they're going to pay for it," he says. Aside from licensing and pricing, another old problem is still hanging around for partners, but this one seems to be improving a bit. The problem, of course, is security, or, more specifically, negative perceptions of the security of Microsoft products. Fully 70 percent of you said that security is an issue in your ability to sell Microsoft software-but only 27 percent of you said that it's a big issue, with 3 percent listing it as the biggest issue. And 59 percent of you say that your customers are satisfied with the job Microsoft is doing in addressing security issues. What they're not interested in, though, is Microsoft's own home-grown security applications-only 21 percent of you reported that your customers are interested in applications such as the Microsoft Forefront suite or Windows Live OneCare. One of the major challenges partners, especially smaller partners, face is gaining entrance to the fortress that is Microsoft. More than two-thirds of you are satisfied with the level of communication you have with Redmond, but sometimes Microsoft's one-way communication can be overwhelming; 31 percent of respondents said that dealing with information overload was one of the biggest challenges they faced in their relationships with Microsoft. Another 24 percent of you reported that finding the right person to contact at Microsoft is a big challenge. Almost 40 percent of you said that it's difficult to find the right person at Microsoft when you need to discuss something. Peter VanRysdam knows the feeling. VanRysdam is vice president of marketing at 352 Media Group, a Newberry, Fla.-based Registered Member. He says that getting started in the partner program wasn't easy. "As someone coming in and hearing about the program, reading about the benefits and deciding we wanted to be involved, it was very difficult from the beginning to wrap our head around exactly what it required, and we didn't get a lot of support when we looked for it from Microsoft," VanRysdam says. "After registering, I half expected a call or someone to help us out there." But nobody called, so VanRysdam went to the Microsoft Partner Program Web site-which didn't prove to be much help, either. "We really tried to figure it out on our own going through the partner program Web site, and more confused we could not have been. It's not a very simple thing to navigate," VanRysdam says. 352 Media finally broke though, he says, when employees within the company who had worked with Microsoft in other jobs offered names of contact people. VanRysdam decided to proactively make contacts, a strategy that eventually helped him make a few inroads. But, at this point, he says, VanRysdam sees little more from Microsoft in the way of communication than a periodic e-mail newsletter. Still, VanRysdam says that 352 Media will pursue the path of becoming a Certified Partner and hopes to increase contact with Microsoft in the process. "We'll feel more involved in once we get to that level," he says. "I think the benefits outweigh the hurdles." Question: What are your top challenges in dealing with Microsoft as a partner? Finding or obtaining the correct information, whether it is from a person, data from the Web sites, or figuring out what you, as a partner, are supposed to be doing next. Oftentimes, when you call in with questions, you're bounced around from person to person. I had one incident that took more than nine months to resolve. Microsoft has such a broad spectrum of products, it sometimes may lead to a partner not even knowing the solution can be found inside Microsoft. Also, searching the Microsoft site can be nightmarish, though Googling it gives better results, but don't say I said that. Question: Is there a good future in being a Microsoft partner? If you position yourself right, if you team up with the right people, if you have the right tools and knowledge you need and if you have the people, being a Microsoft partner will work great for you. Microsoft is obviously a dominant player, and will continue to be so, as long as they can adapt to the market. Being somewhat new to the partner program, it seems that Microsoft is responding. I am looking forward to finishing some competency certifications to see how Microsoft responds with support. When Napoleon declared war on Russia it didn't seem to bother him that 95 percent of his army froze to death. I have a similar view of those who govern Microsoft. Seriously, is there another option? Question: What would you change about the Microsoft Partner Program? The level of support provided by Microsoft is lacking. It's difficult to find the support we need to support our customers. It's excessively difficult to find the right people for support, and it's incredibly difficult to find people to discuss technical theory to understand how a product should be implemented. Bring back the integrity of the program. Allowing big-box retailers to become Gold Certified Partners significantly lowers the value of the program for partners with much more technical expertise. I need one person who is my Microsoft gatekeeper-one call to find anything or anyone I need. Almost half of you said that it's easy to get in touch with the right contact at Microsoft once you've established who the contact is, so cracking the Redmond nut seems to be the biggest hurdle to developing a relationship with the company. You didn't know much about partner account managers (PAMs), though-perhaps owing to the fact that many respondents from smaller companies don't have PAMs. (More than 60 percent of respondents' companies make fewer than $5 million in annual revenues.) Almost 45 percent of you didn't know how accessible your PAM is, and just more than half of you rated your PAM's effectiveness as "neither effective nor ineffective." For Del Ruiz, channel manager at NetPro Computing Inc., a Gold Certified Partner based in Phoenix, having a PAM has been critical to his company's Microsoft relationship. "We recently had a request from a bank in Brazil asking us about our Microsoft relationship, and our PAM immediately sent [the bank] an e-mail saying we are a partner in good standing," Ruiz says. Ruiz, whose company has about 200 employees, says that size matters less than strategy when forging a relationship with Microsoft. Prove that you'll be a strategic partner, he says, and Microsoft will give you more attention, even if you're not a large corporation. Time helps forge bonds, too: "As we build relationships with people at Microsoft, our credibility rises," Ruiz says. At a time when it has become popular for analysts and other observers to predict dark days looming for Microsoft, partners see a bright future in working with the company. In fact, 80 percent of you said there's a good future in being a Microsoft partner. And, according to your other responses, the present is pretty good, too. Microsoft's most recent earnings report, which essentially revealed that the company's latest fiscal quarter was its best in almost a decade, seems to back up the survey numbers. But, as always, nothing is perfect. Licensing and pricing remain headaches, and Microsoft isn't getting any smaller, either-it can still be a monster to navigate. And while customers still have some negative impressions of Microsoft that can lead to sales roadblocks, selling Microsoft in general seems to be easier than it was a decade ago. 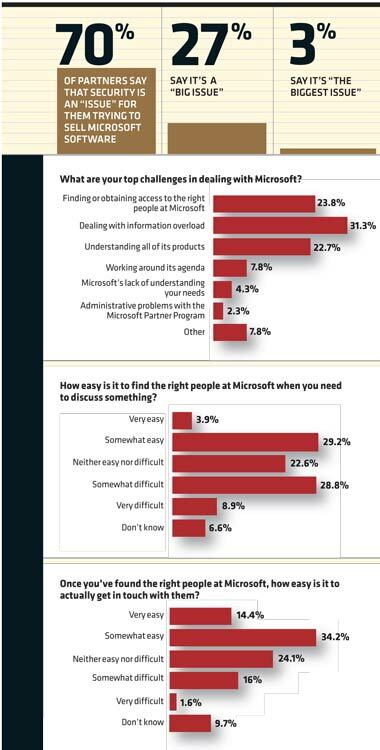 For the most part, things are great and getting better for Microsoft partners, a trend that respondents indicate will continue. Says Ruiz: "Long term, [customers] have a lot of faith in where Microsoft is going, and we benefit from that faith." It seems that's the case now more than ever.